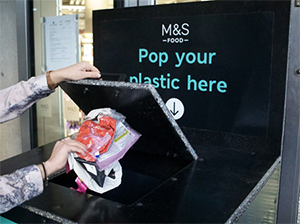 UK Retailers, M&S and Waitrose are taking action to address the issue of plastic waste. M&S has launched a new scheme that will allow customers to bring non-recyclable packaging back to stores to stop it going to landfill. The recycling bins will allow a range of plastic packaging items such as crisp packets, black plastic trays and sachets, which aren’t currently recycled by local councils, to be deposited. It plans to recycle these items for use in store fittings, furniture and playground equipment for schools. The initiative was launched at eight locations across the UK, with plans to roll the bins out to stores nationwide by the end of 2019. Ingeniously, the new bins will be made from the plastic collected in the initial eight stores. Waitrose & Partners is also making progress in its reduction of plastic packaging. In 2018 the retailer removed disposable coffee cups from its stores, and has announced that by March 2019, all 5p single-use plastic bags will be removed. Waitrose & Partners has also announced that customers can use their own containers for meat or fish purchased from their fresh food counters. Waitrose & Partners has a target to remove black plastic from hundreds of items – a step towards its overall aim of eradicating it from all own label products by the end of 2019. One innovative change to using black plastic is the Duchy organic tomato packaging pictured below. 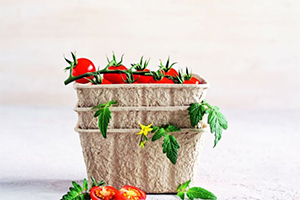 The punnet is made of recycled cardboard and tomato vines, which are often wasted. Sustainability is driving innovation across the supply chain with circularity a key area of exploration – read more about why in this report.